Simplicity at its best at this quintessential summer house with direct access to sandy beaches. Refreshing summer breezes, shady terraces and never-ending sea views ... Cinnamon is a perfect retreat for those looking for a relaxing, peaceful holiday. While there is plenty to see and do in the area, guests often prefer the comfort of their hammock and an occasional stroll through the garden down to the sandy beaches below. Inside: accommodation at Cinnamon is all on one floor. The bright, open-plan living area and kitchen, with their mixture of cheerful colours, antique maiolica tiles, terracotta floors and white walls set the tone for the rest of the house. There are a couple of built-in sofas, a small but well-equipped kitchen area and two sets of French windows that offer wonderful sea views and lead out onto the surrounding shady terraces. A short corridor leads to the shower room and the two bedrooms, a double and a twin. Outside: life at Cinnamon is meant to be spent outdoors. The simple, cosy indoor living areas spill out on to a wrap-around shady terrace from where the views of the vineyards and the sea are magnetic. Fully furnished for relaxing, reclining and cooking (courtesy of the barbecue), the terraces are where you will spend most of your time. Surrounding this little oasis of shade is the large garden, complete with lawns and an extensive vegetable garden, whose produce you are welcome to use. The nearest beach is an easy 5-10 minute walk across country below the house. There are many other beaches within a short drive including the large sea-front of Porto Palo itself. In Porto Palo there is a selection of restaurants and lidos where you can hire sun loungers and umbrellas. Guests staying at Cinnamon also have privileged access to Planeta's exclusive Beach Club at nearby Lido Fiori in Menfi (entrance fees apply). Cycling in the Menfi area is a very pleasurable pastime, thanks to both the quiet back roads and the purpose-built cycle track along and around the old railway line between Menfi, Porto Palo and Sciacca (running very close to Cinnamon). We’d be delighted to have bikes delivered to your villa and, if anyone in your group is an inveterate pedaller, arrange for a local guide to show them the best routes. The house is accessed via a serviceable dirt track which leads from the nearest road for about four hundred metres. Porto Palo di Menfi is on the south west coast of Sicily, between Sciacca and Mazara del Vallo, just a few kilometres east of the fabulous archaeological site of Selinunte. 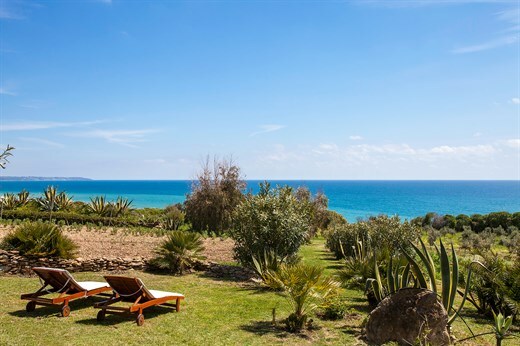 The beaches along this stretch of coast (including that of the Belice Nature Reserve) are amongst the most beautiful in Sicily and guests staying at Cinnamon have privileged access to Planeta's exclusive Beach Club at nearby Lido Fiori in Menfi (entrance fees apply). Most of the gently undulating countryside around Menfi is given over to vineyards and wine-tasting is a must for anyone staying at Cinnamon. Easy day trips from Cinnamon include Sciacca, Selinunte, and Mazara del Vallo, a vibrant fishing port. Also within easy range is historic Marsala, with its old town centre full of wineries, the Phoenecian island of Mozia, the Greek temple and theatre of Segesta and Erice. Further south-east along the coast is the Valley of the Temples in Agrigento. The beaches in the area of Porto Palo-Menfi have received over 20 consecutive "Bandiere Blu", attesting to the cleanliness of the water and their general ecological excellence. "We could not fault Cinnamon villa - just beautiful and so relaxing. " Cinnamon is a lovely house and the beach is beautiful. We enjoyed the level of service provided. It was such a nice surprise to be received by the kind caretakers and presented with enough snacks and a bottle of prosecco so that we did not have to get back in the car to look for a restaurant after a long drive. It was a dream week at this villa. We loved the attention to detail in decorating and providing everything needed for a special holiday. We so appreciated the fresh veggies from the garden TWICE. Everyone we came in contact with, from the owner to the cleaners/cooks & gardeners, were lovely and welcoming. They couldn’t have done more for us. We loved Cinnamon and found it perfect for our needs since we spent so much time out of doors. The outside areas were generous, comfortable and the beach was essentially private and completely wonderful. The proximity to the sea and the peacefulness of the villa were the highlights for us. The experience was a joy. We could not fault Cinnamon villa - just beautiful and so relaxing. We loved being able to walk down to the fantastic beach below and were spoilt for choice with all the lovely outdoor spaces. Inside, the villa was very well-equipped and, though quite small, had everything we needed and was perfect for us. Cinnamon was such a perfectly romantic and beautiful villa! We arrived to find a hamper of delicious Italian goodies waiting for us, and we spent our week sipping gorgeous Sicilian wines whilst admiring the unbeatable view. Having what felt like our own private beach was such a treat – it was so peaceful and beautiful, a great little place to go and relax and forget about everything! The villa is perfectly equipped with everything you need to cook up a storm and enjoy beautiful Sicilian food from the nearby towns. It is really comfortable and quiet, and the team couldn’t have done any more to make sure we thoroughly enjoyed our week! We agreed that it was the best family holiday we had ever had. Not always easy to fulfill the wishes of a large age range and Cinnamon and Sicily with the help of The Thinking Traveller managed perfectly! We had a great holiday. We loved Cinnamon, the Menfi part of Sicily and the service provided by The Thinking Traveller. The tranquillity of Cinnamon and the stunning view at sunset were exactly what we needed! We enjoyed the wonderful small veggie lot which provided us the best tomatoes and eggplants. Cinnamon is a charming, characterful villa. What it lacks in modernity it makes up for in location and charm. It feels liked a well loved family holiday home with well tended potted plants, fresh herbs, flowers and vegetables. Cinnamon had a fantastic location, we enjoyed the garden a lot. Local manager was excellent. She always had a quick solution for our requests. Perfect vacation for the whole family, lots of things to do for the kids as well. We enjoyed the good service both ahead and during our vacation. We will come back. Cinnamon was our absolute ideal villa. The seating and outdoor dining areas, where we spent the vast majority of our time, are well-furnished and thoughtfully presented. The garden is beautiful and boasts a stunning view of the sea beyond. We thought we might miss having a swimming pool but not a bit - we just had to walk down the private path to be swimming in the lovely clean sea within 5 minutes. The beach was lovely - secluded and usually deserted. The light and airy house itself was perfectly sized for two. It's going to be difficult to rent another villa for fear of always comparing it unfavourably with Cinnamon. Cinnamon was absolutely perfect for us, and we want to come again. Hosts wonderful, house charming, good taste, beach fantastic, location perfect for exploring. The beach and private morning swims were blissful. The views from the villa are amazing and the owners are extremely friendly. The villa is located in a remote rural area, which provides an amazing level of quietness and privacy. The walk toward the beautiful and often deserted beach down below is fairly steep and the path a somewhat natural one. The cleaning staff did a wonderful job and also helped us organize the birthday anniversary of our 10 year old son, which occurred during our stay at Cinnamon. We had a wonderful time at Cinnamon and would highly recommend the villa. From the moment we arrived and were greeted by the owners and bowls teaming with fresh fruit, cheese and produce we felt like we were in paradise. The villa is close enough to restaurants and shopping, but feels like a million miles away. Walking on our private beach every morning was the perfect way to start the day. Cinnamon is a fantastic retreat, completely quiet and restful. I'd highly recommend Cinnamon for a couple or family of three, or two smaller children, wishing to get away for a week or two weeks. The beach is spectacular and a five minute walk, the home, cosy and comfortable, with a lot of outdoor space. A sheep farm near for fresh sheep or goat milk, Ricotta, and more! Beautiful. The house, garden and view were lovely. We loved Cinnamon. The small touches and the care taken by the owner shine through. The very generous and thoughtful welcome pack make a huge impact and difference. You couldn't see another villa which was amazing... I can't Think of going on holiday without Think Sicily. The size, amenities and location was perfect for a family like ours. The in-villa cook made a perfect evening for all of us. They did everything possible to make it a memorable evening. The quality of food was superb. We liked the isolated house and the beach we almost had to ourselves. The house was smaller than it looked in the fotos, but ok. The outside veranda was just perfect! The landlady left us such a large food basked with lots of fruit and vegetables. We also liked our neighbours on the piece of land along the fence where you walk down to the beach: a herd of donkeys. What we enjoyed most about Sicily? The privacy of the villa and deserted beach. We thought The Thinking Traveller (the staff, brochures, maps and info) were all outstanding. We also thought the villa was great and as portrayed in the brochure... The house, setting, beach and owners were all wonderful and greatly appreciated. The terrific thing about Cinnamon, however, is access to the nearly deserted beach! The villa was lovely and the setting amazing - could not fault the view or the beach in any way. Having access to the garden with the fruit and veg was an added bonus. Had a lovely rest in idyllic surroundings. We loved the peace and quiet of Cinnamon. It was very private and the setting and views were excellent. The apricots and figs were divine, the fruit from these trees were out of this world so delicious. We thoroughly enjoyed our stay. It was all that we had hoped for. The peace and seclusion at Cinnamon was a rare treat. It was one of the most relaxing and rewarding holidays we can remember... We were very impressed by The Thinking Traveller and would gladly recommend them. It's a property that charms you - small but perfect for its location; an experience in open living. The tranquility of the Foce del Belice beach and sea views were a highlight. A beautiful and very relaxing setting, very peaceful...Vegetable garden is a real bonus. Overall it was a perfect week. The weather was amazing which with a property like Cinnamon, where most of the space is outdoors, makes a huge difference. Much enjoyed break. Great welcome and lovely setting. Property was as described. Excellent... A delightful villa in a beautiful location. We appreciated the pack of food when we arrived. We were absolutely knocked out by all aspects of Cinnamon - the interior decor, the attention to detail, the verandas and the incomparable view. The owners greeted us and left the most magnificent welcome pack and free access to the vegetable garden. We felt really comfortable and very much at home... Absolutely fabulous; a week in Cinnamon recharged us completely... I cannot think of enough superlatives to describe the whole experience of The Thinking Traveller. I have absolutely no negative comments at all and cannot wait to book the 2012 holiday. Cinnamon was a very relaxing location with a beautiful beach just below the house which boasts a special view. Loved it. Exactly what it claimed to be. Really lovely owners. A real escape... Wine delivery excellent as was the arrival grocery shop at Cinnamon. The welcome was warm and genuine and the home made pizza after arriving late due to delay at the airport was fantastic. Having a huge quantity of freshly picked, healthy vegetables and herbs was a cooks dream and provided a week's worth of fun interesting cooking. Being able to pick fresh produce from the field was absolutely fab (please do thank the owners again on our behalf). Would we recommend The Thinking Traveller? Yes. One of the best travel agencies I have ever seen. The villa was more rustic farmhouse in flavour but this only added to its charm. It felt typically Sicilian and to be able to pick our own basil, courgettes and tomatoes from the garden was a delight. It was totally secluded making it one of the most relaxing and peaceful places we have ever stayed in. Note: the bed was quite uncomfortable - time to ask the owners to replace the mattress - odd spring sticking out here and there! The house and surrounding area were really beautiful... We had a wonderful time at Cinnamon. The views are spectacular and it is such a peaceful place, perfect for a relaxing holiday. We cooked outside every day and enjoyed the small fish and grocery shops in Menfi nearby. It was a real luxury to have so many outside areas to relax in and the beach was empty almost everyday. It was very hard to leave and felt like a home from home... we will definitely be booking again... The Planeta wine was delicious and it was lovely to see it there on our arrival... The whole Think Sicily experience was wonderful. The directions to the house were foolproof and the information in general made the trip more easy going. We DID have an absolutely wonderful time in Sicily....We loved the house (and especially the beautifully furnished terraces) and exulted in the peace, tranquillity, sweet air and the marvellous antiquities around us. The food provisions were just delicious, and so generous, and we adored the Planeta wine....La Segreta is now a special favourite! It was a perfect holiday and I think we will be returning to Cinnamon. We'll certainly have no hesitation in recommending ThinkSicily to our friends. We had a wonderful time in both villas. They and their settings were quite different, which we enjoyed. Firstly the dirctions were outstanding. Best we have ever received. The place is basic in nature but the location is wonderful and views, peacefulness of settings ideal for a relaxing holiday... Cinnamon is not my usual holiday accommodation (usually not a rustic person) but it was very romantic and we thoroughly enjoyed it. Excellent services, nice and helpful people. This villa with its beach certainly delivered on 'getting away from it all' but there was a variety of things to do locally if so choose- wine, restaurants, temples..and quick access to either airport (Palermo/Trapani). It was great to have one day completely chilling, another day exploring! Loved making use of the vegetable garden to add to our cooking! The photos of the house (on our site) depicted it perfectly as did the information used to describe it - we were not disappointed... Your guide and the map were invaluble... your service is fabulous! When the weather is kind, Cinammon is really the pefect place to while away the hours. As you say on the website this is the quintissential summer house - modest and simple but everything you need is there. The setting, peace and quiet are magical and I could have spent all day on the terrace just looking out towards Africa! An excellent villa located in a beautiful location with a large garden that was perfect for us and our two small children. We loved the tranquility of the place and that we had the beach to ourselves most days. A very memorable spot! The owners were charming and generous, as was their gardener who brought us twelve bottles of wine!!! We loved our stay.The house was exactly what we wanted. Having rented a lot of properties I am all ways a little uneasy about hidden information but your people were totally open and trueful about the house and location. We loved the feeling of total tranquility and the wonderful sea views .The beach was unbelivable, totally deserted most days (about 15 people for a kilometer) Sundays a few more people but never crowded. Sea safe for young children and only max 5 min walk from the house. All very well equiped kitchen etc. We will be back and I have already recommend you to family and friends.